With every hit game comes a plethora of titles that attempt to mimic the magic to make a few bucks. At 75 million downloads, Rovio’s Angry Birds is one of the biggest casual games since Tetris. One indie developer is hoping that cute flying birds will help propel its game to the top of the sales charts too…and so far they have. Tiny Birds, an iPhone game by Andreas Illiger (a person? ), doesn’t have a lot in common with Rovio’s hit game, except its love for physics and birds that can’t fly. 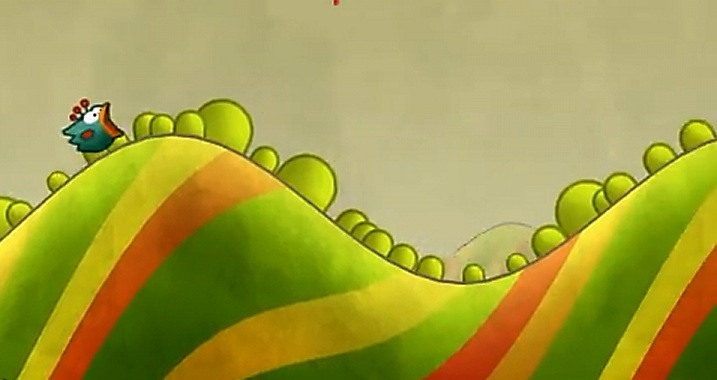 In Tiny Wings, you must ski down hills to gain momentum and propel yourself into the sky. We have to say, despite the obvious thematic similarities with Angry Birds, the game looks pretty fun and unique. In much the same way that EA’s Spore creates and animates majority of its content, the levels in Tiny Wings are procedurally created (randomly generated), so you’ll never play the same area twice. Every “big jump over the ocean” supposedly brings you to a new island with new challenges. Pretty cool. Hell, maybe the creators of Sonic the Hedgehog will borrow some ideas from this. It looks better than any Sonic game we’ve seen for a while. Just add some rings, spikes, bounce pads, and speed to it and you got yourself a new home for the blue hedgehog.